When the emotions find a thought and the thought finds the right words, poetry is born. In Carl Sandburg’s words- poetry is an echo that asks a shadow to dance. Often we find it difficult to analyze or read between the lines and understand the true meaning of a poem. That is when we run behind the interpretations available on the internet, isn’t it? These interpretations not only help us in guided reading but also help us sketch out the personality and the mindset of the poet. ‘The Poetry of Vihang Naik’ is a collection of essays that describe his work. The book has been divided into three sections- part A deals with the details about the poet’s works, the themes and the genre as well. Since Vihang Naik is an acclaimed poet, it was need of the hour to critically analyze his work and present a simplified version of the poems that touch a myriad of themes. Part B deciphers his intent behind penning down some of the most beautiful and most meaningful poems. The last part is interesting because the editor has interviewed the poet and the untwined the personal quotient. It is interesting to know the poet so closely and understand how he perceives things. A protracted process, composing a poem is not an easy task. A colossal amount of thinking and a superfluous flow of words are not enough to express ideas on paper. I have read two of the books by Vihang Naik and I can confidently say that his books explore the surfeit of emotions. The editor/ author has taken a variety of poems into consideration and has used the analogy to explain the significance. The cover of this book is apt and simple. However, I could not ignore the grammatical errors (especially incorrectly punctuated sentences). 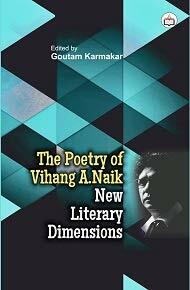 Overall, the book is a route map to explore the depth of Vihang Naik’s poetry. It is a good read.